Now let’s look at what it really says. 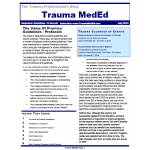 This was a retrospective trauma registry review from a single Level I trauma center. 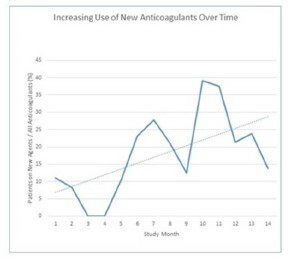 Over a 14 month period, 275 of 1994 admitted patients were on anticoagulants. Bottom line: This is why it’s so important to read the entire abstract and think about the stats. And ultimately, it’s even more important to read the whole paper! They don’t always say what you think they say! Reference: Trauma patients on new oral anti-coagulation agents have lower mortality than those on warfarin. EAST 2016 Oral abstract #24. What The Heck? The Answer! 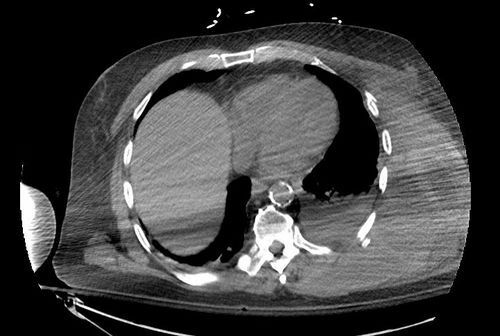 Yesterday I posted an image of an unusual chest CT. The patient had been involved in a motorcycle crash weeks ago, and presented with new onset chest pain and weakness. Exam of the chest showed a hint of diffuse swelling on the left side and moderate tenderness. Chest x-ray suggested a mild effusion on the left. I showed one slide of the CT yesterday, which showed a large amount of complex material in the chest wall. This is most likely a mixture of blood and clot. Now you can see that there are multiple rib fractures present. While comparing the original and the recent scan, it is apparent that the fractures are more displaced on the recent one. Upon closer questioning the patient admits that he did fall down the day before the new pain and swelling occurred. And by the way, he forgot to mention the fact that he had developed deep venous thrombosis and was taking warfarin! And also by the way, his blood pressures were becoming a bit soft. I would consider this life-threatening bleeding! Crystalloid and blood resuscitate immediately. Reverse the anticoaguation quickly, using prothrombin complex concentrate (PCC, preferably 4-factor). Then send him to interventional radiology to see if there are any active bleeders that can be embolized. Finally, it’s off to the ICU to finish up the resuscitation and restore him to normal! We’ve all been faced with injured patients who are taking some kind of anticoagulant, and it complicates their care. Many trauma professionals just say, “they just shouldn’t take this stuff any more." Why can’t we just stop them in patients at risk for injury (e.g. an elderly patient who falls frequently)? Two major risk groups come to mind: those taking the meds who have DVT (or a propensity to get it), and patients with atrial fibrillation who take them to decrease stroke risk. I was not able to find much info (yet) on the former category. But there is a series of nicely done studies based on work from the Framingham Heart Study. The Framingham study started in 1948, and has been following over 5,000 people for the development of cardiovascular disease. In this particular analysis, 5070 patients who were initially free of disease were analyzed for development of atrial fib and occurrence of stroke. Anticoagulants were seldom used in this group. Bottom line: The risk of having a stroke just because a patient has atrial fibrillation goes up significantly with age. So setting an age cutoff for taking an anticoagulant doesn’t make sense. Unfortunately, increasing age also means increasing risk of injury from falls. Warfarin definitely cuts that risk, and it happens to be relatively easily reversbile. However, the newer non-reversible drugs change the equation, shifting the risk/benefit ratio too far toward the dark side. We need some good analyses to see if it really makes sense to move everybody to these new (expensive) drugs just to make it easier to dose and monitor. The existing studies on them only look at stroke, but don’t take injury morbidity and mortality into account. Reference: Atrial fibrillation as an independent risk factor for stroke: the Framingham study. Stroke 22:983-988, 1991. 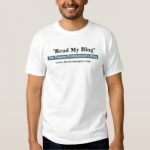 Click here to download a reference sheet for dabigatran reversal.